By the 3rd day, we have finally adjusted to the cold temperature in Japan. No more dreading about taking a shower! Our day was spent at Kuwana City. Actually today we just went to Nagashima Resort, which has a few attractions including a theme park, premium outlets and a garden. Originally we were supposed to go to Shirakawa-go, a traditional Japanese village but my sister decided to cancel it at the last minute since it wasn't snowing (apparently the attraction is the winter scenery of the snow-classes village if it had snowed). Langkah kiri betul trip kali ni! Hmm. Since I didn't have any plans of shopping in Japan (how to shop if I only brought enough for food and transport? LOL! ), this felt like a total waste of time. Still, we saw huge crowds thronging outlets such as Michael Kors, Kate Spade, etc. because of the New Year sale. Next to the outlets, there is a theme park (Nagashima Spaland) which is OMG HUMONGOUS! We can't help feeling excited looking at the roller coasters. Roller coaster je ada beberapa bijik, dengan yang paling panjang (dan tinggi) dari hujung ke hujung park tu! Terasa nak naik sangat2 apa kan daya tak de dalam bajet dan satu lagi, kiteorg ni bawak anak2, abis tu dieorg nak dicampak ke mana kalau mak bapak nak naik roller coaster? So telan air liur je la. 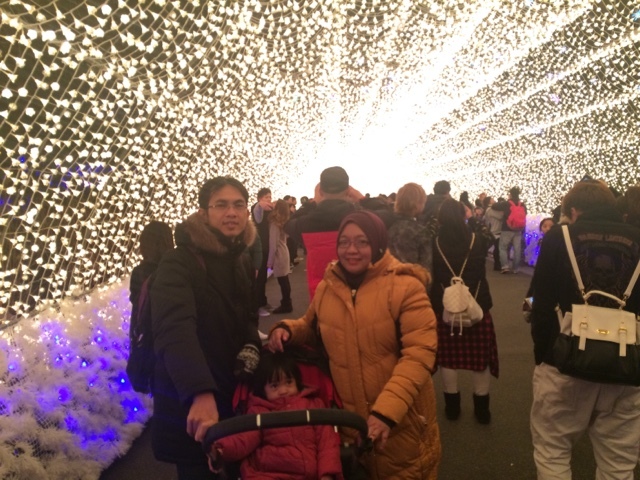 We were glad that our night trip turned out better - which is a visit to Nabana no Sato. Pergh, panjang berjela2 nama! Nabana no Sato turned out to be a another garden (Japan has plenty of gardens for such a tiny island which I loike), but unlike Kenrokuen, the highlight of this garden is in the thousands of colorful LED lights they installed ALL OVER the garden! 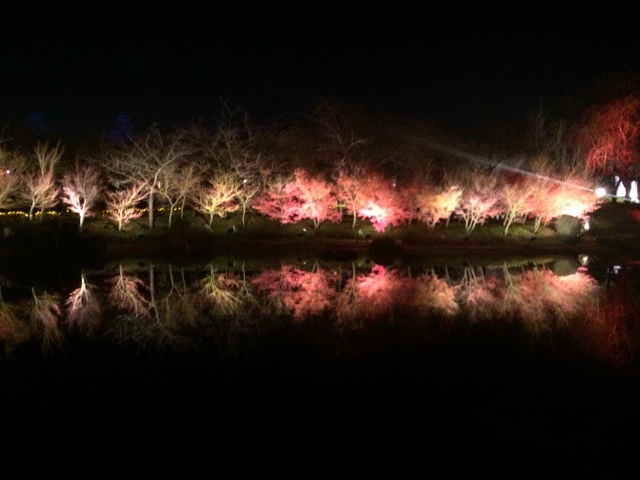 Yup, the whole garden is an illumination display during winter and we felt like we were strolling in a moonlit garden in a fairy tale. Senang cerita, macam kat i-City Shah Alam, tapi lebih besar dan lebih walla! Every year there is a themed display on a giant LED illuminated board and this year's theme looks very much like 'Heidi'. Macam dalam mimpi. Cantik, kan? 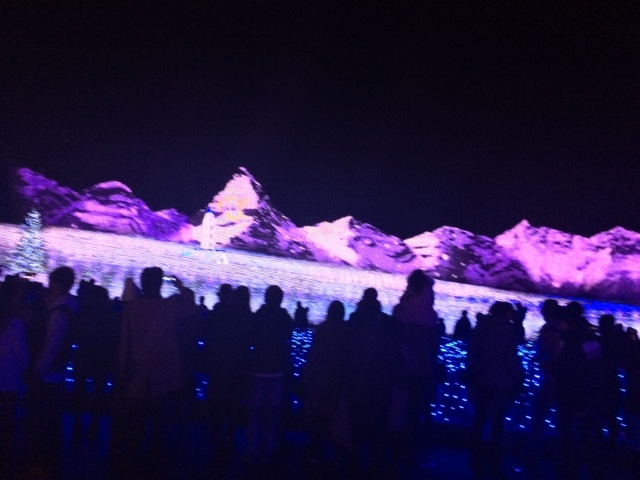 The entrance fee set us back by ¥1100 per person, which includes ¥500 worth food coupon. Before we left the park, we bought ourselves some Turkish kebab, and had our dinner in the chilly open air. Next destination - looking for a snowman!